It's been pretty gloomy and rainy so far this week. No freezing temperatures and snow yet. So I'm not complaining. Strange as it might sound, I am looking forward to those days where we come in the house from the frigid snow and enjoy a nice cup of hot chocolate with those tiny marshmallows. Until then, I will enjoy this rain. What a beautiful blog you have! I love your sweet illustrations. I'm just stopping by to say thank you for the nice comment that you left on my tutorial. Thanks! They are the prefect little pair! Adorable!!! 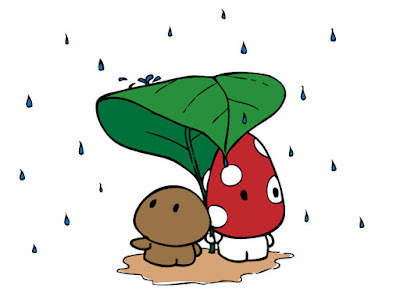 Cutest couple under the rain! What a lovely drawing! What programm do you use to color them?